Description Include or exclude traces from a volume using one or more header-based constraints. This process retains or drops traces using one or more header-based constraint. A trace must pass through ALL conditions to be included in the output. Note: If you filter on a header that defines the volume extents, then the extents of the output volume will reflect that constraint. For example, applying the rule Include / INLINE / In Range / 500–600 to a 3D volume will result in an output volume with the inline range of 500–600. In the Process tab, click the Add icon and select New Process. 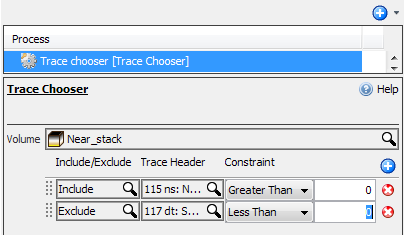 Select Trace Chooser and type a name for the process. In the Details Panel, select the Volume to choose the traces. Include/Exclude — Include or exclude the data according to a constraint. Trace Headers — Trace headers on which the constraint is applied. Bit is Set — matches a value with this bit set, when bit 0 is the least-significant (i.e. bit 0 corresponds to 2^0, bit 1 is 2^1, etc…).